Independent studies and the latest BS building energy rating specifications EN15232 state that the use of a controlled lighting system can provide energy savings of over 30%. In addition it can provide a more sympathetic environment for occupants. Nevertheless a typical current controllable lighting system suffers from disadvantages. It is expensive to install in new buildings or to retrofit, whilst in the latter case modification is generally difficult, is disruptive to occupants and may damage the building fabric. The TeroLight intelligent lighting solution from TerOpta overcomes these problems by utilising the existing mains wiring to carry control signals. Therefore the building fabric is not impaired, control cabling does not need to be installed, and modification is easy. The system is simple to install with its intelligent marshalling boxes being fitted and then interface software, lights, sensors and switches being connected, so that the system can be up and running very swiftly. Having been designed for use by unskilled operatives, operation is straightforward and intuitive via a web browser, with little training required. The system can be expanded or modified at any stage by simply adding or moving TeroLight units. Moreover there are no serviceable parts, and therefore the system has a very high reliability and can be classed as “fit-and-forget”. Its operational life is calculated to be more than 15 years, with a typical payback period as little as 24 to 48 months. TerOpta Ltd has been developing the TeroLight intelligent lighting system for a number of years. 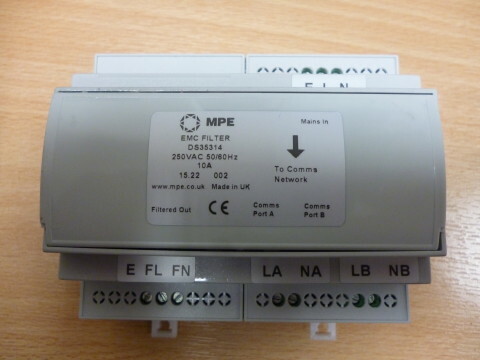 The system is based upon independent marshalling boxes being used to control different elements or circuits within buildings with communications between them using mains born signalling. To ensure signal integrity and high system performance, mains born noise and intereference needs to be removed from the system. In 2012 TerOpta approached MPE to develop a custom EMC filter for use within their system, after having unsuccessfully tested many commercial units.. Since the marshalling unit had already been designed and prototyped, the space envelope, mounting style, connection type and cost budget were prescribed to MPE, who were asked to achieve a level of electrical performance within these limits. MPE became heavily involved in the development and testing of the filter units within systems to determine the optimum level of electrical performance that would ensure the correct operation of the TeroLight system. The result has been a custom unit, very different to those typically manufactured by MPE for its defence customers.